If you have a baby with goopy eyes, it is possible that it could be due to pinkeye, eye infection or a tear duct that is blocked. To understand the condition, you could browse through our pictures to diagnose the problem through our symptom guide. After knowing what kind of eye infection your baby is suffering from, proper treatment measures should be taken to take care of baby eye infection. 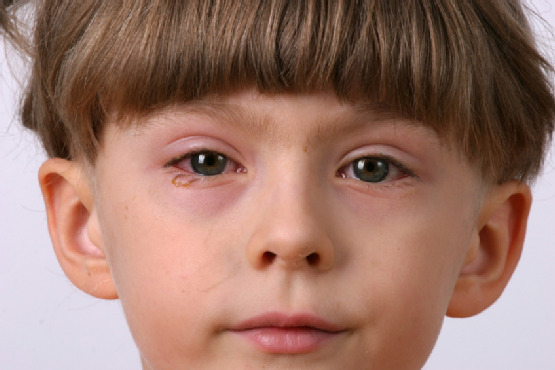 If you notice a red bump on your child’s eyelid, it could be a sty, also known as Hordeolum. It usually occurs when the bacteria infects the oil glands present at the eyelash base. Typically, it appears red and tender as it is filled with pus, but you might also observe white or yellow discharge through the boil and this makes the eyelid a bit crusty. Though it isn’t dangerous, you should treat before it turns into a serious infection that could be painful for the baby. Warm wet cloth compress. Although a sty generally drains out on its own, you can alleviate your baby’s pain by applying a clean and wet washcloth soaked with warm water to the eye. Though your baby might feel uncomfortable and resist you, make sure you hold the washcloth in place for at least 15 minutes and repeat the procedure about 4 times a day. You can do this when the child is sleeping or distracted. It takes a while for the sty to drain out on its own, but through this simple home remedy the heat from the washcloth draws the pus on the front and makes it break open and drain quickly. Leave the sty alone. You must remember never to meddle with the sty. Never try to break it open on your own either by squeezing or popping it as this might make the condition worse and make your baby suffer in pain. Prevent infection. Clean the sty area with a wad of cotton or clean cloth once the sty drains out. In addition, you should use different washcloths for both eyes to prevent the infection from spreading further. Many babies develop infections due to antibiotic drops given during birth. It is also possible that the baby might have developed an infection while travelling the route of the birth canal. If you notice that the whites and lower rims of either of the eyes are red, it could be Pinkeye, also known as Conjunctivitis or Redeye. It usually occurs when any irritant or allergen irritates the membrane covering the eye whites and the insides of the eyelids. Though the infant’s system fights the infection, the eyes become a little crusty. Virus. Viral infections are very common and if your baby has a cold and conjunctivitis, it’s possible that it’s a viral infection. Bacteria. If you notice thick sticky yellow discharge in your infant’s eyes, it could be induced due to bacteria like hempphilus, streptococcus and staphylococcus. Allergen. Though it is rare for infants under one year to suffer from allergic reactions, it is possible that your baby might be suffering from an allergic reaction to smoke, dust or pollen if the eyes appear to be swollen, watery and red with a runny nose. 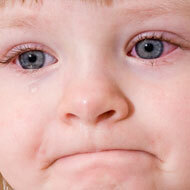 If your baby has conjunctivitis, consult your doctor immediately as it could prove to be a serious infection. The doctor will treat the baby depending on the kind of infection diagnosed. Viral Conjunctivitis clears on its own, but your doctor will instruct you to keep your baby’s eyes clean by washing it with warm water and removing the discharge. However, if you don’t notice an improvement in the condition even after two weeks, you should consult the doctor again. 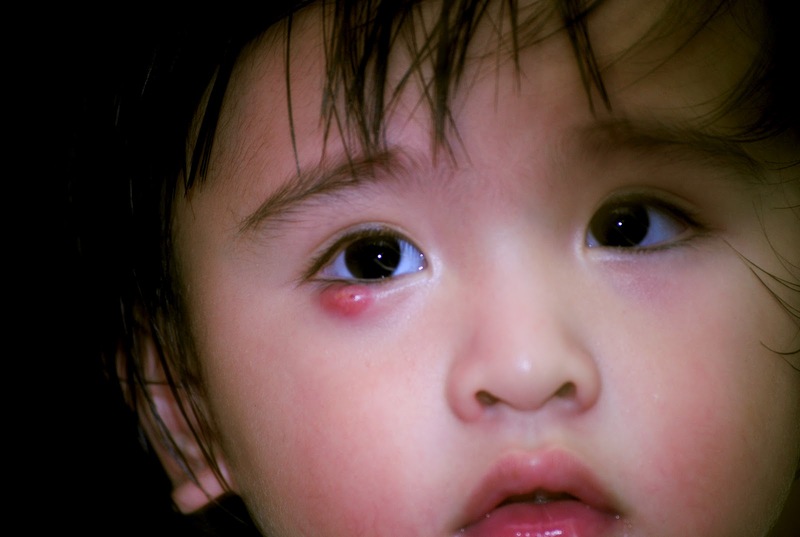 Chalazion is a cyst or lump formed on the eyelid. It is often confused as a Sty, but a sty grows close to the skin’s surface and often produces discharge while becoming tender and red. A chalazion however can start as small as a poppy seed and grow to be as big as a pea. It is not contagious or painful, but the baby’s eyes might be teary and it could distort your child’s vision by applying pressure against the eye ball after it grows more. 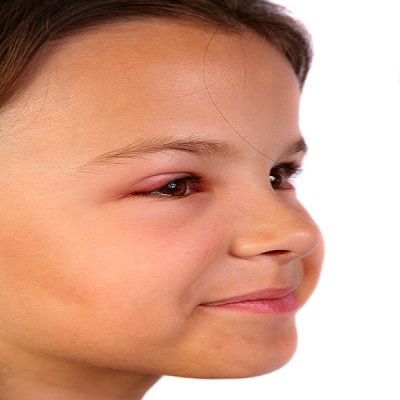 Though a chalazion usually disappears in a matter of weeks or months on its own, you can help your child by getting it treated quickly. Warm compress. The doctor might advise you to apply a warm compress, as it softens the oils blocking the duct and encourages drainage. Firstly, wash your hands and child’s hands to prevent any other kind of infection. Make your child comfortable and apply warm compress to the affected area for 15 minutes and repeat the procedure 4 times a day until the small lump disappears. Prevent infection. Never try to meddle with the chalazion by popping it. Use any antibiotic drops or ointments prescribed by the doctor to prevent infection. Seek professional help. If the lump doesn’t disappear even after the compresses you might need to consult an ophthalmologist as an injection might help the child. If an injection doesn’t work, it can be removed through a surgical procedure. Blepharitis, another kind of baby eye infection, is caused when the eye lids suffer an inflammation. It is generally caused due to a bacterial infection or the overproduction of oil in the eyelid. Though it can disappear on its own, it might come back and it is chronic. You must consult your doctor to conduct a thorough examination. A child’s eyes might be watery, red and irritated due to this condition and the eye lashes may fall off if another infection develops. Though this Blepharitis can be irritating, it doesn’t cause any problems with vision but it often serves as a path for a chalazion, sty and conjunctivitis. You can use a warm compress coupled with some antibiotic drops and ointments after washing the child’s eyes thoroughly. You can also use saline solutions and baby shampoos to clear the baby’s eyes. 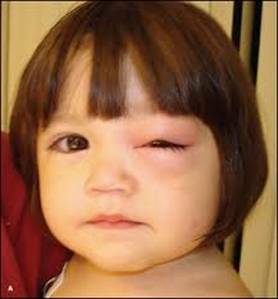 This is a serious baby eye infection that affects the tissues around your baby's eyes. You should consult a doctor immediately if the baby’s eyes are red and swollen. It generally affects only one eye, but it can be treated. It is caused when harmful bacteria enters the eyelid. Other symptoms for this infection include fever, runny nose and pinkeye. You don’t have to panic when the doctor examines your baby thoroughly using cultures, X-rays and blood work, as this infection can be treated easily. The doctor might prescribe some antibiotic ointments or an injection to reduce the infection depending on the severity of the infection, but it usually clears in about 2 days. Even if the symptoms go away, make sure your child takes all the antibiotics prescribed to prevent the infection from resurfacing again.